Pituophis is a genus of non-venomous colubrid snakes commonly referred to as gopher snakes, pine snakes, and bull snakes. Species within the genus are found throughout the United States and Mexico. Heavy bodied, keeled scale snakes, these constrictors are commonly kept and bred as pets. Bull snakes sometimes exceed 8 feet in length, and specimens of up to 100 inches have been recorded. This makes them among the largest US snakes, although generally not as long as indigo snakes or as big around as rattlesnakes. 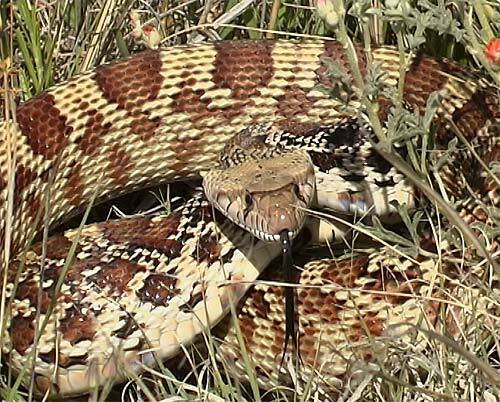 Here you may post messages or questions pertaining to all aspects and issues regarding the keeping, breeding, health, and conservation of all Pituophis (Bull, Pine & Gopher snakes).